Relaxing bike trip along the Vltava River to Troja Chateau (Baroque Summer Palace). PRAGUE RIVER TOUR TO TROJA CHATEAU is a nice and easy bike tour along the Vltava River. Catch a cool breeze as we ride through parks and along the river. We follow our favorite bike path going out of the center of Prague to the first Baroque Summer Palace in Prague - Troja Chateau, built in the 17th century for the Counts of Sternberg, is located near the Prague Zoo and Botanical Gardens. Along the way your tour guide reveals some of the unique Prague history about the area and shows you its hidden natural beauty. We will visit the biggest of Prague's parks, Stromovka and Letna, where we stop for cold Czech beer or Czech Cola-Kofola, or warm drink when the leaves are brown or the summer did not come yet :) On this tour we will introduce you to the history of brewing traditions in the Czech Republic and show you places where you would like to come back. Let us show you where the locals like to come and relax in the summer sun or enjoy golden fall. Note: This tour is off Prague's tourist path! Use of regular & electric bikes are allowed for the same tour. 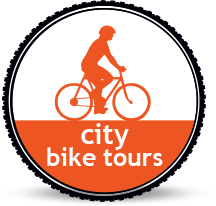 The tour goes at an easy and not a fast pace and using an e-bike will not make you go faster but makes the trip easier.